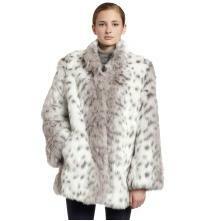 This long-sleeve “Badger” car coat in grey/white Faux fur has a mockneck, zip front and pockets. Face of 100% acrylic; back of 100% polyester; lining of 100% polyester. Made in China. A.B.S. affordable luxury caters to the contemporary woman’s never-ending craving for fashion to wear the latest trends and look fabulous, whether at work or play, with the fabric quality and attention to detail found in designer collections. Schwartz’s instinct for trends is present in each and every design, with vivid colors and prints that stand out and make a statement that the A.B.S. client expects. The media has widely covered Schwartz and aided him in reaching a national and international audience. He appears regularly on Entertainment Tonight as a style expert, as well as frequents fashion segments on CNBC, CNN, the Today Show and Oprah. Allen and the A.B.S. brand also receive consistent editorial coverage in the major fashion magazines such as Vogue, Teen Vogue, InStyle, Lucky, Cosmopolitan, Elle, Us Weekly, In Touch and People. Schwartz was recognized by Forbes magazine as heading one of the nation’s fastest growing fashion companies. After over two decades of designing for his moniker brand, A.B.S., Schwartz is even more passionate than ever about design and predicting the next trends. ”It’s all about the here and now.” Allen Schwartz resides in Southern California with his wife and two children.